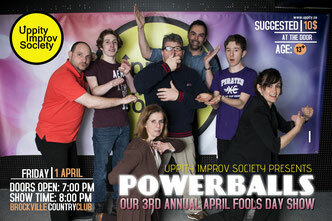 Contact with the Uppity Improv Society may cause laugh lines. Think: High stakes action thriller - meets Daytime soap opera drama - meets Topical political satire - meets... THE UPPITIES. This summer, strap in for a thrilling showcase of Sketch and Improv Comedy NEVER SCENE BEFORE! Hang on to your Record of Employment forms, update your Linked In profile page, and try not to LOSE it, as you bust a gut at this Summer Blockbuster of a show. Three Nights Only: Thursday July 26th, Friday July 27th, and Saturday July 28th. Doors (and bar) open at 7pm. Show starts at 8pm. Tickets are only $12 each or groups of 8 for $80. What is the Uppity Improv Society? 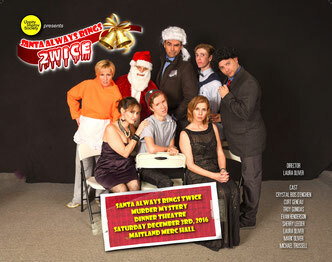 Driven by audience suggestions, we create a fast paced comedy show right before your weeping eyes! Original comedic Comedy Murder Mysteries that weave local, international and political themes of into a thrilling laugh packed Who Dunn-it. Want to unlease your inner funny? You'll come for the training and leave with an unexpected pack of hilarious stories that YOU HELPED TO CREATE!